Not many of you know this, but I am a tax delinquent. In 2010, I did not pay my taxes. The IRS caught me, and BOOM! I have to pay my taxes including interest in fees. Only, I did file. I e-filed, and the IRS (apparently) rejected my e-file. I was never notified. I now owe $150 in fees and interest. What is funny to me is that the e-file I sent the IRS was good enough both for the State of Louisiana to base their taxes upon and FAFSA, a federal government agency, to disburse my student loans. Today I accomplished an important goal that has been hanging over my head for awhile now. 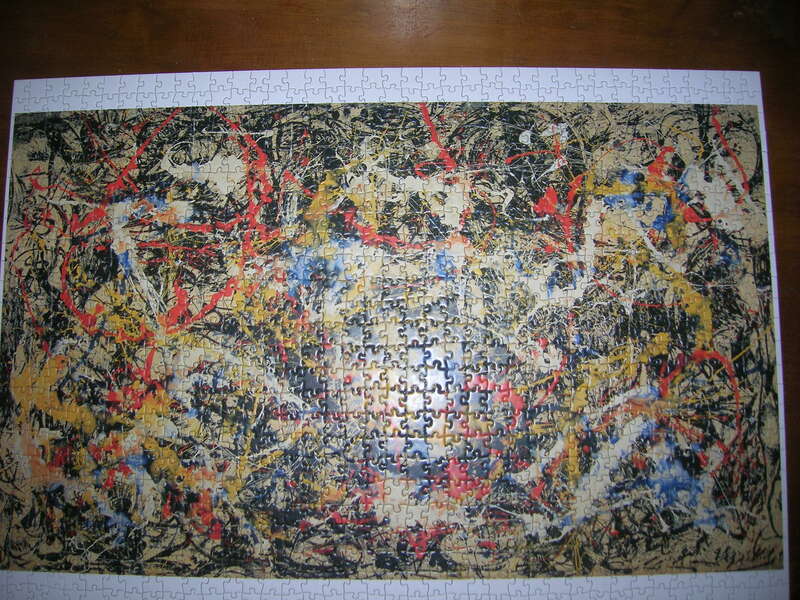 Last year I bought a Jackson Pollock puzzle at Barnes & Noble. It was the first puzzle I have ever done that nearly defeated me. I actually gave up on it for most of the spring semester, but with the advent of summer, I thought I’d give it another go. Today, I finished it. I actually had to approach it in different ways. At first, I organized all of the pieces by shape, so that I could place them more easily, but one of the neighborhood stray cats jumped up onto the table and knocked them all over the floor. Next, I tackled the pieces by color, which worked somewhat. I finally found success by taking each piece and finding it on the box art, then placing it in its corresponding spot on the table. As more pieces got filled in, I was able to begin to work on it normally, by shape and color. Anyway, I thought the finished puzzle would be a good start to this blog. This is a major hurdle in the way of my dissertation writing (ha ha) that is out of the way. Now I have more time for video games!